Rick Allen has been a Saddler for nearly 38 years. His involvement in this old and esteemed profession developed from a desire to make his own Archery accessories while serving in the Royal Australian Navy. Rick is also a qualified Trainer and Assessor. Rick’s wife, Lesley brings to this Christian partnership many years’ experience in the fields of administration, along with 13 years’ of working at the bench with Rick. Lesley is now involved in many aspects of the Saddlery trade, including prepping of leather work, stock saddle patching, re-lining and re-stuffing saddles, saddlery repairs, rug repairs and manufacture of BSA Synthetic whips. 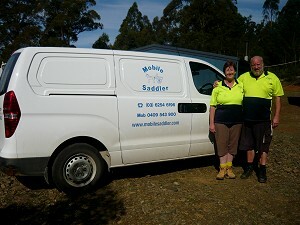 Together they run Mobile Saddler Pty Ltd, sharing many adventures together, and meeting many amazing people on their mobile runs throughout Tasmania. When they are not on-road, Rick and Lesley are usually found in their workshop, manufacturing quality saddlery and tack and undertaking for their clients. Mobile Saddler underwent some major changes in 2012. After 8 years on the road, living and working out of a Truck, Rick’s arthritis began to get the better of him! The three-week rests in between the runs ended up just not being enough time for it to come right. Something had to give! Medical advice was to give up the strenuous work and do something else….which led to the development of…. The Remote Area Training Arm of Mobile Saddler Pty Ltd. This arm of Mobile Saddler started in 2011 when they were asked to deliver Saddlery Repairs and Maintenance to participants at Palumpa and Wadeye in the Northern Territory. This was a CDEP Program to assist them in getting work at the local Cattle Station. From that they were invited to train a similar course at Coen FNQ. Apart from Saddlery, Rick’s other main passion is Training, and in 2012 he took a position working for Ngaanyatjarra Aboriginal Council as their Training Coordinator. Based in Warakurna (Gibson Desert), he was in control of 12 Communities in Western Australia. To enable Lesley to continue on with the business, the Truck was replaced with a Hyundai I-Load Van. 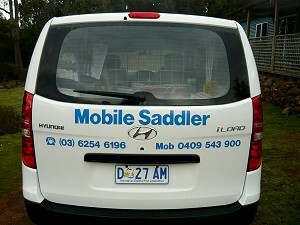 This was the perfect addition for the new shape of the Mobile Saddler business. 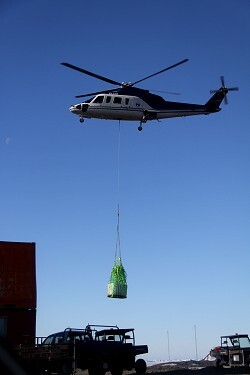 This meant that Lesley was able to do the same runs in Tasmania, picking up repairs to be brought back to the workshop. They would be returned around 10 days later, after which she would continue on into the next area and pick up from there. Sadly at this time, the Victorian side of the business had to be let go. Rick came home every 12 weeks (usually to a long list of saddle jobs!). In between Lesley would travel up to visit Rick in the Desert. While at Warakurna, Rick and Lesley delivered Leatherwork engagement courses in Warakurna, Blackstone, Wingellina, Jameson, Warburton and Wannan. After 6 months at home the Training took Rick north again to Yarralin (4.5 hours west of Katherine NT for 17 weeks delivering a Foundation Skills Certificate. As Rick is a Holistic Trainer, this was done around a project to build steel grave frames, coupled with mapping the Cemetery and Leatherwork. 10 weeks into this gig, he was asked to deliver the same Certificate to Pigeon Hole community (a further 2 hrs west) he did this around a renovation project and Leatherwork. Towards the end of this he assisted other Trainers get thru their caseload at Timber Creek and Mengan. Next it was off to Aurukun in FNQ to fix a problem for the RTO. Delivering the same Certificate, but this time around a full 6 weeks of Leatherwork. Whilst he was there, Mobile Saddler was asked to deliver their own program of teaching people to make Leatherwork Souvenirs with indigenous art carved and painted on to them at Daly River. This was wrapped around a Certificate II in Business.